There was a giant-killing in the Trophyland Cup first round at the weekend as Division Three’s Thames Ironworks Community took on Division Two’s Walthamstow Avenue at Cave Road. In a closely fought clash, a single goal was enough to settle the tie with Danny Child scoring the all important goal to send Thames through 1-0 into the second round. Repton Park remain top of the table in the Premier Division and continued their great start to the season with a big win away at Upshire. Jesse Spearing knocked in four goals and Ciaran Kelly a hat-trick adding to Joe Kemp and Charlie Henry efforts in a 9-2 victory over the county champions. Moving up to third place are Flanders who played host to a Romford Elite side who were eager to get their season back on track. Joshua Thompson got on the scoresheet for Elite but Flanders also scored to level it up at 1-1 with the sides having to settle for a share of the spoils. 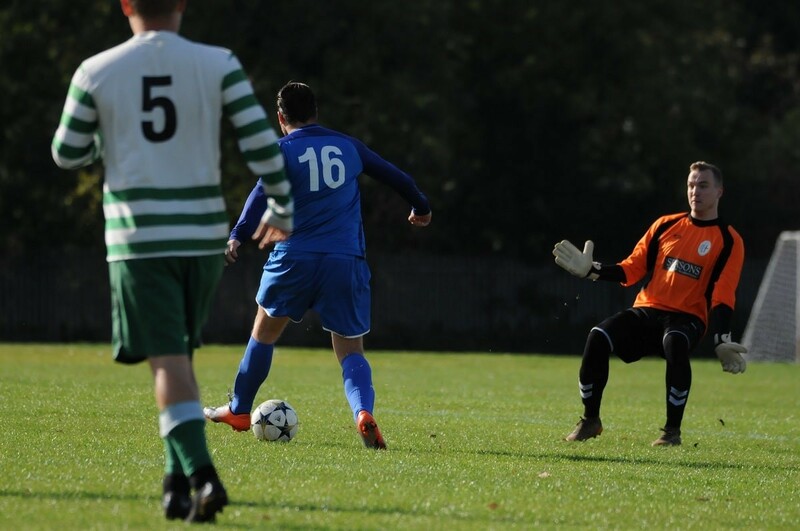 The division’s other action saw an entertaining six-goal thriller in Newbury Park where two of the season’s promoted outfits, Barking & Dagenham Wanderers and East London Old Boys, went head-to-head. After a goal-filled encounter, the sides took home a point apiece in a 3-3 draw. In Division One, Chingford Athletic have moved up to second spot and closed the gap on the league leaders to just two points as they ran out winners in their home clash against Wanstead Albion at the weekend. Michael Johnson scored twice with Tom Pearce and Joseph Cloake also netting to win 4-2, rendering Albion efforts from Jerald Aboagye and Emmanuel Adegoke as just consolation. Ridgeway Rovers are up to third in the standings as they continued their perfect start in the league with a 3-1 home win against previously unbeaten St Augustines. Dave Brown got on the Saints’ scoresheet but two Rovers goals from Sean Minta and one for Duone Minors completed the win for the promotion chasing side. Moving up to sixth place and staying unbeaten are Korona Redbridge who made it two wins and a draw from their opening three matches with a 3-0 victory away at Valiant. Dawid Smolarek, Zoltan Somogyi and Jacek Miedzak each scored to keep their sides good run going. Virtue secured a second win of the season when they made a trip to Westferry Elite on Sunday. Three points separated the sides before the game but it was Virtue who made the trip home as the happier of the sides, recording a 4-2 victory to move up to seventh place in the table so far. It couldn’t be much tighter at the top of Division Two as FC Kulture Klub moved to the top of the standings after a big win against a previously unbeaten Goresbrook outfit. Marcus Castano, Ali Mussa and Fabio Nunes scored the goals to help their side to a 3-0 victory in Chadwell Heath to move top on goal difference. Dagenham United also frequent that area of the league table and remain unbeaten this season following a win away at Ferns Seniors at the weekend. Sean Thomas scored twice and Aaron Nuet once to help their side to a 3-1 win, overcoming a Ferns goal from Ross Coney in the process. Both Barking and Lonsdale remain in touch with the leaders and those sides met on Sunday at Mayesbrook Park in a game of six goals. The in-form Jack Marston found the net once again for Lonsdale along with Aristid Ndokaj but Danny Cook’s brace for Barking plus further goals for Jordan Cook and Aaron King secured the win for Barking in a 4-2 scoreline. Moving up to seventh in the table are Bretons Manor who were away at London Fire Brigade on Sunday with both sides looking to get some momentum going after indifferent starts to the season. A Manor brace from Kane White and a Sam Cooper effort were sufficient to earn Bretons the 3-0 win on the day. Alpha have opened up a three point gap at the top of Division Three after their opening five games of the season, remaining unbeaten after they saw off the dogged efforts of Roneo Colts on Sunday at the Flats. Connor Wallace’s effort was the only goal of a tight game as Alpha recorded a fourth win in five. One of the sides chasing on the leader’s coat-tails are Hornchurch Oakmont who made it three wins from four matches and stay unbeaten following a big 7-1 win at home to West Essex on Sunday. Thomas Gibson scored a hat-trick to go with an Ellis Marsh brace and a James Mitchell goal for the Oak. There was plenty of entertainment in the match between Masterman and E4 Rangers where goals from Tim Dye, Mitchell-Christopher Edmonds and Macauley White had given E4 a 3-1 lead at the break. However, Masterman efforts in response from Lewis Foster and a John Bruce brace rescued a point to keep both sides locked in that mid-table region. It’s all change at the top of Division Four as Grey Area moved to the summit with a big win on Sunday over Oak Royals. Moyo Oba scored a hat-trick, braces arrived from Khadean Campbell and Jack Malone and Harrison Bedwell’s goal completed the scoring in an 8-1 victory for the visitors. The other key result at the top of the table saw Woodford’s perfect start come to an abrupt end as they went down 4-1 away at fellow promotion chasing Newham Athletic in Beckton. Kane Greene scored twice with Steven Courtney and Wes Scott also netting for Newham to render Sol Norris’ effort as just a consolation in the end in a massive result. Another incredible feat saw AC Milano Reserves make it four draws from their first four games of the season sending statisticians into a spin to check whether that has been done before. They were up against East Ham Inter but defences were very much on top as a rare goalless draw ensued between these well matched sides. In the Essex Sunday Junior Trophy, Royal Albert have secured a place in the third round of the competition as they overcame fellow Corinthian outfit, Custom House Community, in their second round tie, winning 5-3 on the day. There was also a stunning result in the London Sunday Junior Cup where Asianos Reserves played host to Top Deck who travelled from South London to take on Asianos. The hosts made the most of home advantage to send their opponents to a 6-0 defeat, booking a place in the second round in the progress. There was a shock in the West Essex Sunday Charity Cup first round where Division One’s Valentine United were up against it with a trip to Premier Division side Ultimate Vision on Sunday. But the lower division side put in a sterling performance to run out 4-1 winners and go through to the quarter finals of the competition.